“For this project it was critical that we had tight coordination with Craig DeAndrea, one of the partners with Woodbridge Stereo/Video. We created the design and then Craig worked with us to provide suggestions for the most effective implementation,” said Karla Trincanello, owner of Interior Decisions. The theater was placed in the basement, where they once stored coal. The walls and floor were concrete and since it had never been heated, the project included a new Gio-Thermal heating system. The result was ductwork on two walls and the ceiling, which made it necessary to designfalse walls and a drop ceiling to hide them. Threehorizontal steps on the soffit facade concealed the ceiling drop. By continuing the stepped soffit design on all walls, a balanced perimeter was created. The ceiling medallion provides a sense of more room height and the monochromatic aubergine color offered a highly dramatic effect. Interior Decisions designed a custom cabinet/bar unit for the lobby, which also housed the AV equipment. A pair of KEF XQ40 floor standing speakers were selected for the front L/R channels with a matching XQ50c placed on a stand for the center. Rounding out the 7.1 channel system are four KEF CI200.3QS in-wall speakers concealed behind the upholstered acoustical wall treatments, plus two KEF HTB2 powered subwoofers were neatly hidden behind the draperies flanking the screen. The electronics included a Marantz SR8002 receiver and BD8002 Blu-ray player. For video, a Marantz VP15S1 1080p DLP video projector was placed discretely behind the rear wall and projected onto an 82” Da-Lite wall mounted screen. This kept the ceiling free for decorative painting. Rounding out the system is a Lutron Grafik-EYE to manage the 6-zones of lighting and a URC MX900 remote control. The biggest challenge were the acoustic treatments. Since the space was small, thick ceiling and wall treatments couldn’t be used. Moreover, the acoustical solution had to be economical, yet, capable of isolating the theater from the floor above. For the ceiling, a combination of mineral wool insulation coupled with an isolation method that reduced the ceiling height by less than 2” was employed. For the walls, rather than having fabric-covered acoustical wall panels that were fabricated to fit, they used a ” flexible acoustical material that was laid in place on the walls and then upholstered over with an acoustical fabric, which was also carried into the lobby area. The combination of this treatment and the solid surfaces of the columns and soffits provided the perfect acoustical balance. 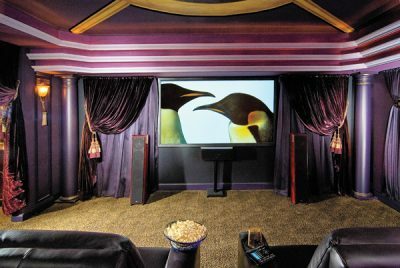 Due to the limited ceiling height in the rear and the room’s overall shallow depth, a combination of commercial-style theater seats on a low riser in the back and two sets of high-quality, fully-reclining, leather theater seats for the front, were chosen.